Circumstances have come together in such a way that we are taking a trip home. We were generously offered the use of a buddy pass from my sister, at about the same time Alaska Airlines changed their policy to allow pets to fly in cabin in Mexico. We were also near a spot we can leave the boat for a reasonable price, and if we travel now it will be summertime in Seattle, and we can return to the boat in time to sail north to avoid the worst of the hurricane zone. So even though it violates some weird goal I had in my head of being gone a year before heading home, we are flying to Seattle on July 19th for a two week visit. Of course this is not without some complications. 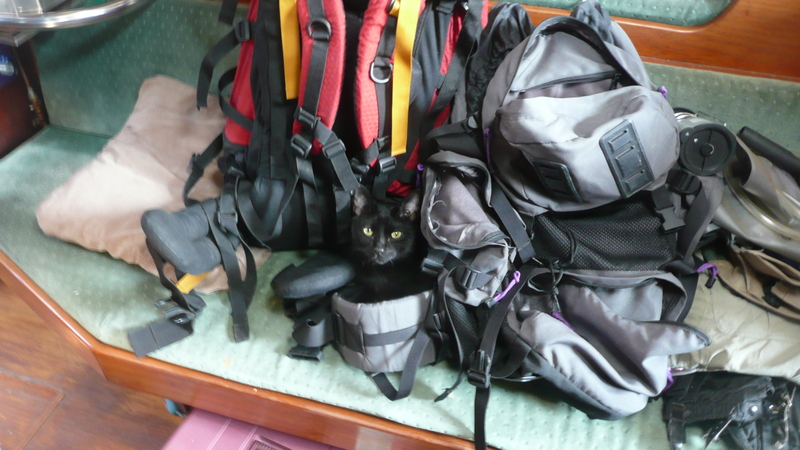 The great little hard kitty carrier we’ve been toting around on the boat all this time (it does store the as of yet uninstalled anemometer quite nicely) is apparently about three inches too tall to fit beneath an airline seat, where Minon will have to ride. This is concerning since Minion is taller than the case when he stands up. But thanks to a lucky find of an appropriately sized duffel bag, Jenn’s sewing skills to put in some mesh panels, and the kind donation of a political yard sign from the recently completed Mexican elections which we cut up to make a floor, we have a soft kitty carrier we think will fit under the seat. I’m not sure how Minion is going to cope with such a cozy space for the two 2.5 hour flights and a four hour layover, but we are hoping for the best. 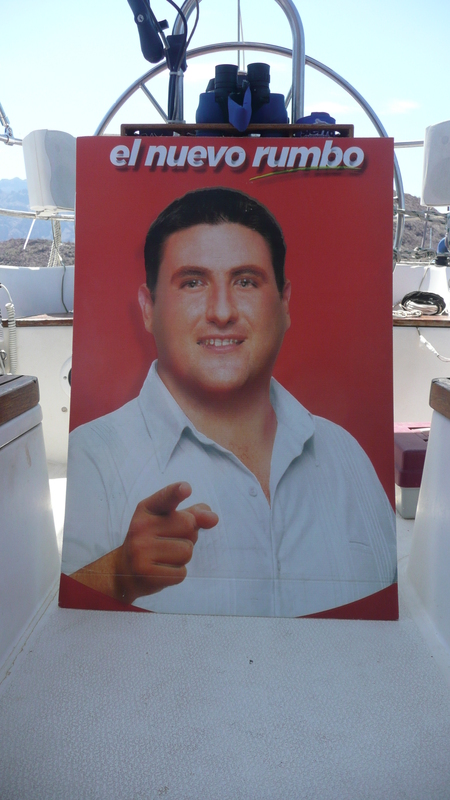 Another new cruising couple on a yet unnamed boat is going to give us a ride to the airport. We had actually discussed catching a ride with the to the US at the end of July when they are driving up to the Bay Area but this will be a little quicker trip for us. Since, as the saying goes, cruiser plans are written in sand at low tide, they were understanding about us not riding up with them. It will be nice to have a planned ride after our hitching to town experience that involved a lot of walking and standing in some very powerful sun, and the phrase “careful of the machete” as Jenn climbed into the back seat of a the pickup that stopped to pick us up on the way back. I figured being warned to watch out for the machete was a pretty good sign, vs. not being warned about one and having it surprise us later. I’m not sure we would have been given this sign if they had known we were going to cut it up to line the bottom of a kitty carrier. After our trip to town today pick up a few last supplies, we now have two days to pack, clean up and prep the boat for our two week absence. While there is very little threat of a hurricane here this time of year, there is still the possibility of a Chubasco with up to 70 knot winds so we’ll leave as little as possible on the decks and lash down the sails. We are leaving the boat on a mooring ball, and we’ve heard the ground tackle holding the mooring balls here are in good shape but I may toss on the scuba gear and dive down to look at the one we are on, just to make sure. Of course, in our perfect world we’ll leave the boat spotless so we can come back to a clean boat with our bags full of new goodies to explode into. We’ve started some packing, and I actually managed to locate a jacket which I’m afraid I may need. I’m still trying to find socks, and have realized that my swimsuit count may outnumber actual shorts. While swimsuits make fine daily wear here, I might be better off wearing more traditional clothes while out and about in Seattle. Assuming all our remaining clothes for temperatures under 85 degrees are located and packed and the boat is sufficiently prepped, we’ll be in Seattle in a couple days hoping the sunshine comes with us, and that we don’t go into some sort of toxic shock from having the daily high temperature not be as hot as the heat we try to beat in the middle of the night with fans and a lack of blankets. It will be whirlwind tour of friends, family, shopping, fountain soda, crunchy tacos, home cooked meals, micro brews, trying to remember how to drive (ignore that if you’ve offered us the use of a car) and couch surfing. We may even go sailing. All while actually wearing clothes, coats even, with a black cat in tow. I can’t wait! Minion wants to make sure we don’t forget to pack him too! This recently ran through the Seattle sailing community like wildfire, but since not everyone following this blog is part of that community I thought I would share it here. It highlights Duck Dodge, a local Seattle beer can race with theme nights, along with a few clips of the Downtown Sailing Series run out of the Elliot Bay Marina. Seeing it after leaving Seattle was a tad bittersweet, over the last few years Duck Dodge has been one of the highlights of my summer, if not my overall life experience. Jenn and I met on the Duck Dodge and I’ve made new friends during it along with cementing some old friendships. I’m sure I’ll peek at this from time to time as I travel the world on my boat for a reminder of one of my favorite events back home. If you see a black boat with a unique yellow stripe named Absolutely, Jenn and I are probably on it. Of course, the end of the video reminds me why I’m sailing into Mexico in a couple days.